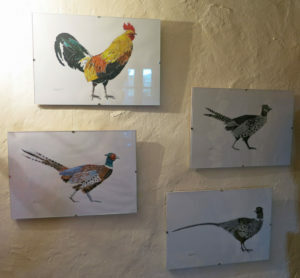 We’re so please to be able to tell you that we now have on sale at Huxtable Farm B&B some beautiful lino prints of some of North Devon’s beauty spots and bird collage prints by local artist Annie Hart. Annie Hart is a local artist who moved to North Devon in 1982 to start work as an Art teacher at nearby South Molton Community college. She gained a degree in Graphic design in 1979 from Bristol Polytechnic. 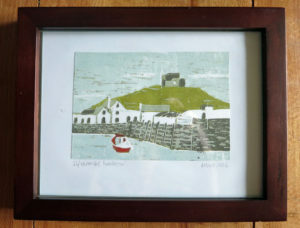 Annie works in various media including watercolour, lino-print, acrylic and collage. 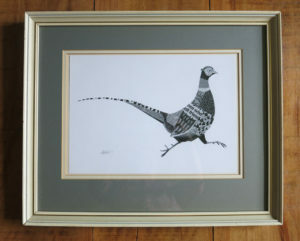 Annie has exhibited locally and recently produced illustrations for country parks e.g., Colne Valley Regional Park in London. She undertakes commissions in any of the media above and common themes are flowers/landscapes/birds/local views etc. and is happy to work from photographs. These make great souvenirs of your stay at Huxtable Farm B&B, West Buckland, Barnstaple, Devon, in addition to the beautiful Huxtable Farm Jacob wool cushions, throws, wool and hand knitted hats etc. To help you enjoy what’s going on in North Devon during March we have some SPECIAL DISCOUNTED RATES at Huxtable Farm B&B until 30th March 2017.